Powers/Abilities: Leslie Farrington is a ruthless businessman, suspicious of his own board members, and eager for power. 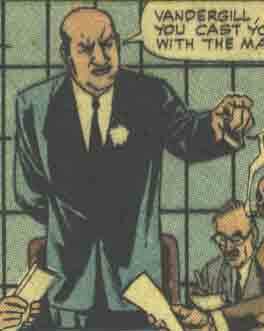 History: (Strange Tales I#137) - Farrington concluded a meeting at Imperial Industries International, then told his assistant Arnold Brown to prepare a dossier on every member of his boardroom, right down to the last detail. 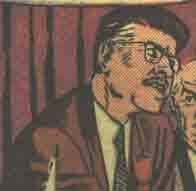 (Strange Tales I#138) - At another meeting, Farrington forced Vincent Vandergill to cast his vote with the majority, and Vandergill reluctantly agreed to. The lights went out during the meeting, as a signal to the Imperial Hydra (Arnold Brown) that Nick Fury had been captured, and was being held beneath the building in HYDRA's headquarters. Farrington called the meeting to a close, and asked Brown to report any rumors about the board members trying to oust him. (Strange Tales I#139) - At another meeting, Wilson began to stand up to Farrington, even as HYDRA was threatening the United States with its Betatron Bomb. 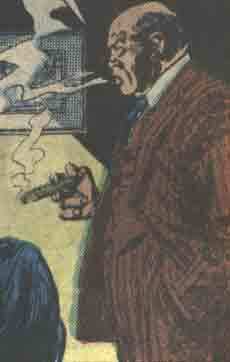 Wilson was concerned, and suggested they vacate the premises, but Farrington refused up until a explosion shook the building (from Nick Fury breaking out of his cell). (Avengers I#270) - Years later, when Farrington saw how public opinion was against the Sub-Mariner, he decided to launch a lawsuit against him for all the damage he had done to New York back when he was an enemy of the surface world. They demanded that Namor pay $2,000,000,000. (Namor I#13 - BTS) - Namor was ultimately found guilty but insane, and placed on 100 years probation. There was no word of how much Imperial Industries International was awarded. Comments: Created by Stan Lee, Jack Kirby and John Severin. 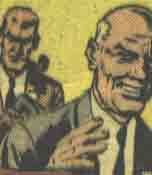 Farrington and all of his staff were played up as possible contenders for the identity of the Imperial Hydra, mainly to distract readers from Arnold Brown, the true Imperial Hydra. I'm sure he's tired of hearing it, but Roger Stern-- YOU ROCK! Great use of Farrington in Avengers I#270! 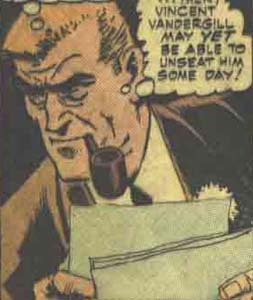 Stern may have meant Vincent Vandergill to be the character he used in Amazing Spider-Man I#249-250 (and later in the Hobgoblin Lives mini-series), but he was named in ASM I#250 as George Vandergill. Pity. Hodges, Wilson and Vandergill may have been among the board members seen in Avengers I#270, but none of them were referred to by name. Hodges was a board member of Imperial Industries International, and was a friend of Wilson. He shared Wilson's concerns about Leslie Farrington, but was convinced that Farrington was the best man for the job. Vincent Vandergill was a board member of Imperial Industries International, and was determined to break Farrington's hold over the corporation, hoping to take over the company himself. He hoped that Wilson and Hodges might be sympathetic to his cause. Wilson was a board member of Imperial Industries International, and was a friend of Hodges. He was often concerned by Leslie Farrington's dictatorial tendencies.